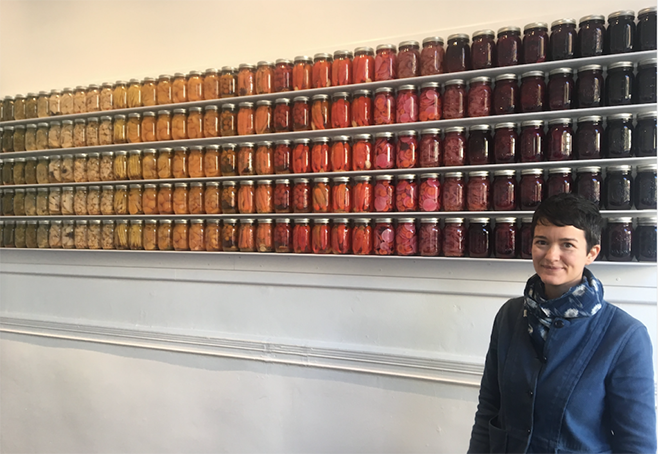 Kelli Rae Adams’ Curing Time: In Pursuit of Preservation & Sustenance featured a rainbow array of Mason jars of pickled produce spanning the length of an exhibit room at the World’s Fair Gallery. The installation also included a series of clay tablets recording the extensive labor involved in growing and harvesting the produce, curing it, bottling it and mounting the work. Kelli has been going to farmers markets in Providence for years and has gotten to know SCLT growers and staff there. 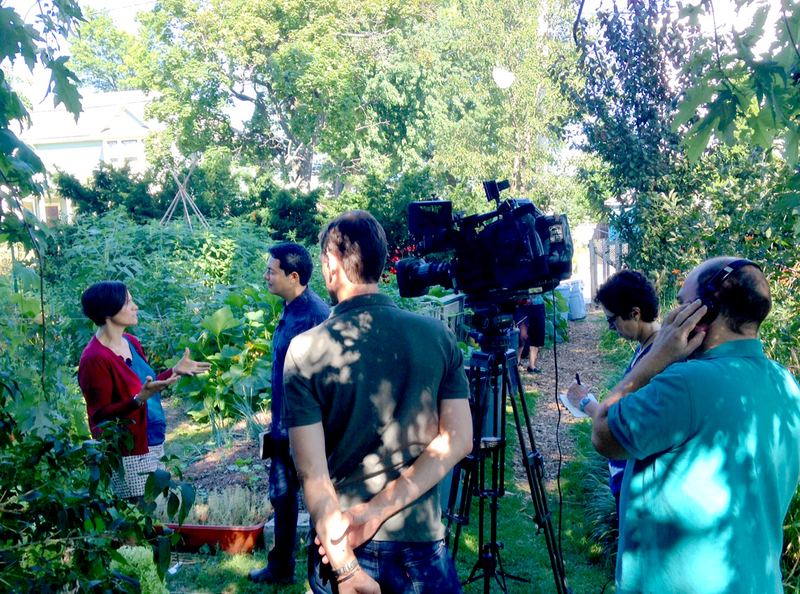 Curing Time showcases produce from several local farms, including City Farm and others that belong to the Little City Growers Cooperative, and the Somerset Hayward Youth Enterprise Farm. Canning and preserving food were a vital part of Kelli’s own childhood, and using local produce in her piece was critical. Besides their authenticity, Kelli hopes to utilize her art as a vehicle to engage viewers in thinking about food access and food insecurity. Over in Pawtucket, interdisciplinary artist May Babcock was also inspired recently to use plants from SCLT’s farming network as her raw materials. May specializes in printmaking, hand papermaking, sculpture and book arts, and says Rhode Island’s environment has informed her art. Having looked extensively at plant ecologies, she uses plant fibers to make paper, including invasive plants, such as mint, mugwort, vetch and Japanese knotweed she gathers at Galego Community Farm, not far from where she lives. “I’ve been using what’s available, so it makes sense to use these plants that nobody wants,” May said of the knotweed, in particular (which grows in abundance at Galego). Last spring, she teamed up with SCLT to teach kids and their families at the Galego Court Housing Development about the different weeds at the farm that can be used to make paper, offering a unique way for them to engage with the materials that nature provides. Fourteen participants harvested plant fibers and turned them into pulp that then became paper.